FromeFM is a Frome based non-profit community radio station run by Frome Community Productions CIC. We believe that a great community radio station gives people a voice, entertains and acts as an outlet for creative expression which connects people more deeply and improves lives. We support various community groups and give them a voice and way to connect through our programmed shows. We aim to represent and entertain our diverse community, so we are produced by trained members of that community broadcasting new shows every month, including music, spoken word, debates and reportage, and coverage of the work of community groups. We also aim to support vulnerable and/or isolated groups through outreach, partnerships and collaborations. We desperately need funds to finish our studio build - so there will be two studios to create more great content for the people of Frome and surrounding villages to listen in on 96.6FM. Please give generously. For the price of a fish & chip dinner, you can really help us connect more parts of our wonderful community. 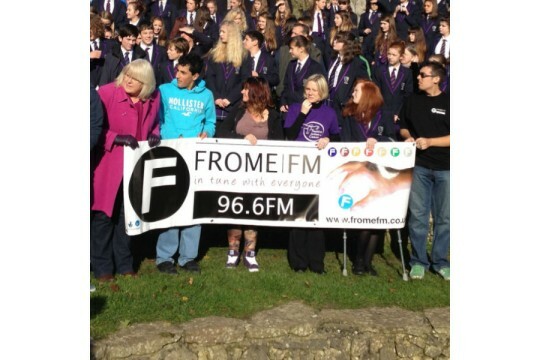 Love Frome, Live Frome FM.